Office Space - Chesterton, Staffordshire. Fully furnished office spaces for up to 10 people are offered on short or long leases just 2 miles from the centre of Newcastle Under Lyme. 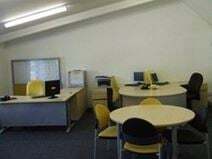 The offices are open plan and have both workshop and storage facilities. The site includes a reception and on-site parking and is ideally located for road travel.